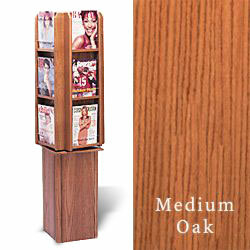 This floor-standing magazine rack made of oak is very popular because of their functionality, durability, and great finish! 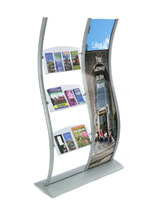 The holders automatically add warmth and style to waiting rooms, reception areas, and anywhere else that a reading material display might be needed. 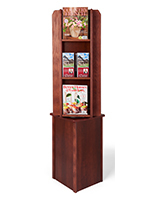 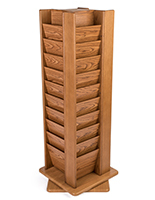 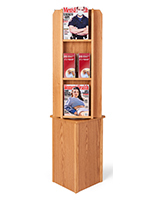 The revolving literature stand, magazine rack is 16-1/2" wide x 61-1/2" high x 16-1/2" deep so they stand at a proper browsing height for many consumers and clients. 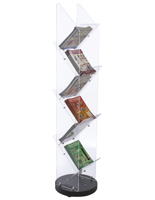 The sturdy periodical display has 12 pockets that each measure 9" in width to showcase wider publications if needed. 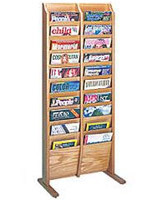 This magazine rack, called a reading material holder, can also fit 24 sets of pamphlets in the same pockets or mix and match literature for a varied look. 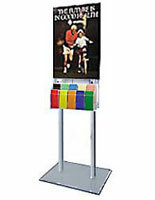 The top half of the display rotates with a static base for a unique looking fixture.